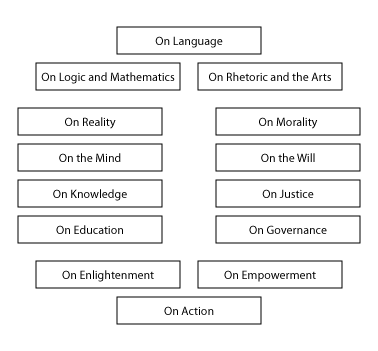 A series of essays laying out a comprehensive system of philosophy. This series of essays is the latest incarnation of a project long in progress. Since I was very young I have had very broad academic interests, and by the start of adolescence I had already resolved to somehow write down my thoughts on all of those varied topics. 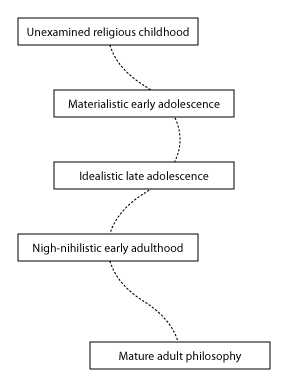 Through my adolescence those broad interests were increasingly reduced toward two fundamental poles of sorts: my natural science interests boiled down to physics, and my social science interests boiled down to something in the direction of economics or political science. Always searching for ever more and more fundamental cores of those fields, I eventually realized that my interests were essentially in what I now recognize as roughly metaphysics and ethics. When I discovered formal academic philosophy early in college and realized that those two things were, broadly speaking, what the field was all about, that eventually became the focus of my collegiate studies, culminating in a bachelor of arts degree with highest honors majoring in philosophy. While working toward that, I had further goals of pursuing a doctorate afterward, and began work on what I then expected to eventually become my dissertation. After not pursuing that doctorate for pragmatic reasons, I still wanted to complete that work, which I was by then calling "the Codex", and began to self-publish the work in progress. It was to be an elaborate dialogue between invented characters and a fictitious version of myself, exploring the wide range of possible views on every philosophical topic, and where my views fell among them. 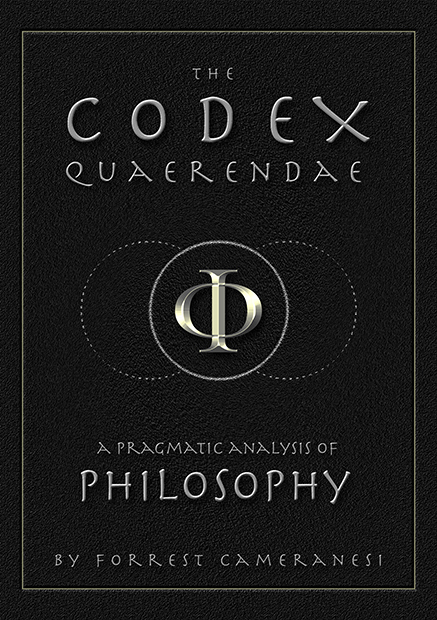 I eventually gave it the full title of "the Codex Quaerendae", Latin for "the Book of Questions", in the sense of a book about the act of inquiry. But finding myself, as the years wore on, increasingly without the time or energy to complete such a grandiose project, I have now settled for a much humbler goal: this series of essays, laying out in my own natural voice those same ranges of views and topics, and where my own views, only slightly refined by the passage of time, fall within them. Though my views have not changed much since I began this work properly, they have evolved dramatically over the course of my life, and because of that I feel great sympathy toward many views quite different from my mature ones, having once held similar views myself. I was raised in a religious family and so in my early childhood held unexamined and innocuous-seeming religious views, against which I never had a very strong backlash; I merely felt that I grew out of them as I aged and learned more about the world, and was in fact surprised in my adolescence to realize that adults sincerely held those views and didn't merely teach them as metaphorical stories for children. The new views that I grew into amid my adolescence were themselves, in retrospect, mere secularizations of views structurally similar to the religious ones I had grown out of: faith placed in learned academics to be the authorities of knowledge and reality, and in responsible politicians to be the authorities on justice and morality; merely replacing faith in some divine authority, which might well not even exist, with faith in the correct human authorities, whoever they should turn out to be. As I approached adulthood, however, my views grew increasingly skeptical. Focusing on how to determine who the correct human leaders were to guide us to knowledge and justice, the right emphasis increasingly seemed to be on methodology, not authority. The correct academics to trust to lead us to knowledge were the ones dedicated to the correct scientific method; and the correct politicians to trust to lead us to justice were the ones dedicated to the correct system of rights and duties. And with such methodologies identified, it seemed not to matter who employed them, as anyone using them would have as much claim to authority as anyone else using them, effectively undermining all claims to special authority on either knowledge or justice. But that in turn raised the question of how to identify the correct methods that would, if only we could get people to follow them, lead us all to knowledge and justice; and whether there really was or even could be such methods at all. I had definite opinions on what the correct methods were, but skeptical infinite regressions that I learned more about as I studied philosophy continued to undermine the very possibility of ever grounding any opinion on anything, leading me eventually far away from my earliest faith in divine authority, far from any trust in human authority or even in individual human ability to pursue knowledge or justice ourselves, into a nigh-nihilistic depression where it seemed any claim about anything must be denounced as just as equally baseless as any other. That philosophical depression coincided with an actual period of depression about my own life circumstances, around the same time I finished my philosophy degree; and the way I eventually found my way out of that real life depression turned out to also be the key to salvaging my philosophical views from abject nihilism, eventually building my way back up to views somewhere around the middle of that wide range I had crossed between early childhood and the end of my philosophical education. I will elaborate later in these essays exactly what that way out was and where in that range my views fall now. The purpose of this history is merely to illustrate that no matter where in that wide range from naive faith to abject nihilism you might find your own views, I have probably held similar views myself at one point, and have sympathy for why you hold your views now. And I hope that that gives me the necessary perspective to explain sympathetically why I no longer think they are the correct views to hold; for I expect most readers, of most points of view, to largely disagree with the overall worldview I am going to present, since I have long since disagreed with most of the possible worldviews I have encountered in my life. These essays are targeted primarily at a lay audience, one without professional philosophical education, and as such I will be attempting to include a brief education on the arguments that have been had thus far on each topic that I will discuss, definitions of the technical terminology used, and so forth. However, I am still attempting to engage with the contemporary professional philosophical discourse in these essays, hoping not merely to pass on an overview of the thoughts of others that I learned in my own professional education, but to put forth my own original thoughts as well. When I was younger and had more grandiose aspirations for this project, I once aimed to position my philosophy as the kind of epoch-defining synthesis of opposing sides of great philosophical divides that has repeatedly punctuated the history of western philosophy. After the first recognized western philosopher, Thales, in the period that we now call Presocratic philosophy, there were two broad schools of thought: the Ionians, following mostly after Thales' student Anaximander, and the Italiotes, following mostly after Anaximander's student Pythagoras. That period ended with the work of Socrates, which incorporated elements of both schools of thought. But then in what we call the Classical era of philosophy, there were again two broad schools of thought, one following after Socrates' student Plato and echoing the more abstract leanings of the Italiotes, and another following after Plato's student Aristotle and echoing the more practical the leanings of the Ionians. The field was again united much later under the Scholasticism of Thomas Aquinas, who again incorporated elements of both Platonism and Aristotelianism, in what we call the Medieval period of philosophy. Out of that unified Scholasticism the field was again divided, at the start of what we call the Modern period of philosophy: into what came to be called the Rationalists, following largely after philosophers like Rene Descartes and echoing the abstract leanings of the Platonists; and the Empiricists, following largely after philosophers like John Locke and echoing the practical leanings of the Aristotelians. Then Immanuel Kant once again briefly reunited philosophy, explicitly creating a synthesis of Rationalist and Empiricist thought. But immediately following Kant, the current Contemporary period of philosophy was again divided, between the Analytic school, following philosophers such as Bertrand Russel and echoing the abstract leanings of the Rationalists; and the Continental school, following philosophers such as Georg Hegel and echoing the practical leanings of the Empiricists. I'm painting a very rough historical picture here of the relations between these different periods' main schools of thought, and I don't want to seem like I am claiming too much continuity between them: merely that each period of division seems to always have one side emphasizing mathematical, ideal, or linguistic abstractions, and another emphasizing the experiential, embodied, practical life. When I once dared to dream bigger than I probably should have, I dreamt that maybe some day I would be "the new Kant", in that I aim to once again reconcile the linguistic abstraction (as well as the precision, detail, and professionalism) of the contemporary Analytic school, in which I was primarily educated, with the practical and experiential emphasis (as well as the breadth, holism, and personal applicability) of the contemporary Continental school. But I don't pretend anymore that that is likely to ever happen. Instead, I am only presenting my views as food for thought for whoever should happen to read these essays. I don't even intend to, properly speaking, argue in a persuasive way that you the reader ought to change your mind in this way or that. Instead, I intend merely to state what it is that I think, and why I think it, and leave it to you to consider the merits of those thoughts and my reasons for them, and what if any impact that ought to have on your own view of the world. I am merely presenting my worldview here for you to try on for size, and see how you like it. Most of the individual pieces of my philosophy are not by themselves wholly new to the world, and when they aren't I will try to mention prior thinkers who have held similar views, for the reader's further reference on those lines of thought. But I have often independently reinvented these positions prior to learning that other famous thinkers already wrote extensively on similar thoughts long before I was even born. As such, my versions of these positions are often slightly different than the usual ones learned from a study of the history of philosophy. But it is not so much those small differences in the individual pieces, but the overall structure of my philosophical worldview, the way that all of these different positions on different topics fit together to mutually support each other, that I think is the greatest novelty of my philosophical thought. In the essays that follow, I will begin by laying out very generally the broad kinds of philosophical views that I am against, leaving behind a picture of what kind of philosophical view I very generally support, which I will detail further in an essay of its own. I consider that general philosophical view to be a naively uncontroversial, common-sense kind of view, from which various other philosophical schools of thought deviate in different ways; and I aim to shore up and refine that common-sense view into a more rigorous form that can better withstand the temptation of such deviation. Very loosely speaking, that general view I support is merely that there are correct answers to be had for all meaningful questions about both reality and morality, and that we can in principle differentiate those from the incorrect ones; and that those correct answers are not correct simply because someone decreed them such one day, but rather they are independent of anyone's particular opinions and grounded instead in our common experience. Put another way: that what is true and what is good are beyond the decree of any of us, yet within reach of each of us; and that we can in principle always eventually tell whether someone's opinion is right or wrong, but we can never immediately assume any opinion to be such, and must give each the benefit of the doubt until proof is found one way or the other. That general philosophical view is the underlying reason I will give for all of my more specific philosophical views: everything that follows does so as necessary to conform to that broad general philosophy, rejecting any views that require either just taking someone's word on some question or else giving up all hope of ever answering such a question, settling on whatever views remain in the wake of that rejection. In the rest of the essays that follow, I will lay out more specifically what my positions are on a wide variety of particular philosophical topics, ranging from abstract matters concerning language, art, and math; through descriptive matters concerning reality and knowledge; through prescriptive matters concerning morality and justice; and finally on matters of practical living, what one might call my philosophy of life. Begin with the first essay, Against Fideism.